Instead, I finished my second pair of knitted socks. These turned out without a glitch as I think I am getting more comfortable knitting them. I used same circular needle as in the previous pair (see post and picture here), and this time I actually made sure the size was right by trying it on as I made it. Also, I found this tutorial for stretchy bind off and used it on this pair: the ribbed edge is soft, beautiful, and very stretchy! Since I am a newbie at this, I prefer to just play with yarn color as opposed to changing patterns. 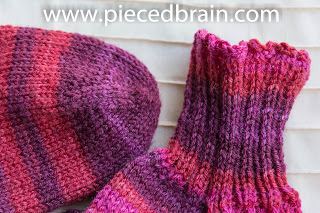 Once I can knit the socks in my sleep, I will try to other patterns. This yarn (Saki Silk) is very soft, you can put the socks in the washer and dryer without concern and, best of all, the colors are gorgeous. 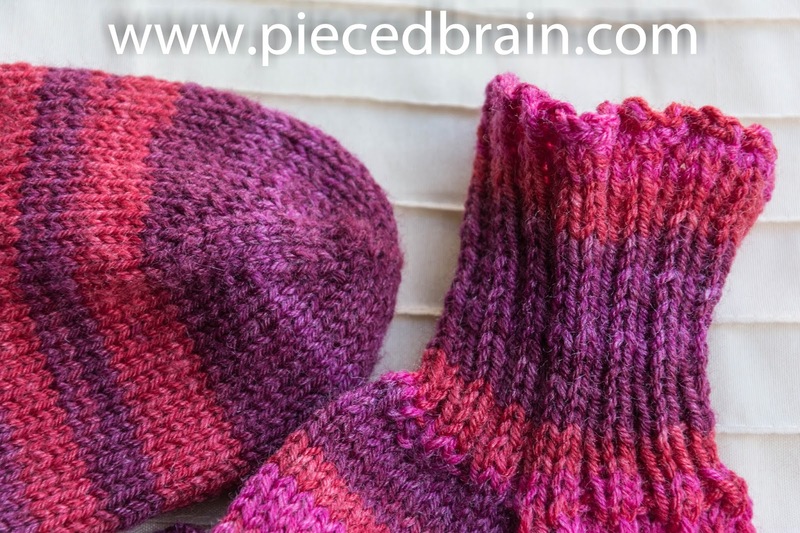 Knitting them two at a time is quick and it ensures you do finish the par. No UFOs here! Bonnie from City Home/Country Home (you have got to check out her blog!) said I should make one for myself, as I am making these for my mom. Well, I think she is right. I tried these on and they felt wonderful on my feet! I'd better mail these out right away, or my mom will get only the first pair! I am having so much fun knitting that I went to JoAnn's yesterday and bought some yarn to make more beanies for my boys, nieces, and nephews for Christmas (as if I needed an excuse to shop). The round robin quilt will have to wait until tomorrow. The headache lingers despite Advil, a little caffeine, lots of fluids. Oh, well.